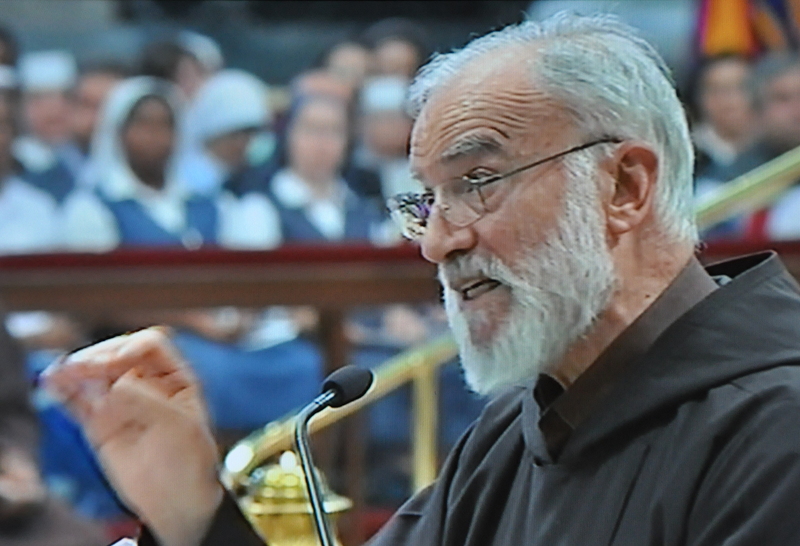 Here is the second Lenten homily given this year by the preacher of the Pontifical Household, Capuchin Father Raniero Cantalamessa. Let us continue our reflection on the principal documents of Vatican II. Of the four “constitutions” that were approved by it, the one on the Word of God, Dei Verbum, is the only one—along with the one on the Church, Lumen gentium—to have the qualifier “dogmatic” in its title. This can be explained by the fact that the Council intended with this text to reaffirm the dogma of the divine inspiration of Scripture and at the same time to define its relationship to tradition. In line with my intention to highlight just the spiritual and uplifting implications in the Council’s texts, I will limit myself here as well to reflections that aim at personal practice and meditation. The biblical God is a God who speaks. “The Mighty One, God the Lord, speaks. . . . He does not keep silence” (Ps 50:1, 3). God himself repeats countless times in the Bible, “Hear, O my people, and I will speak” (Ps 50:7). On this point the Bible presents a very clear contrast with the idols who “have mouths, but do not speak” (Ps 115:5). God uses words to communicate with human beings. But what meaning should we give to such anthropomorphic expressions as “God said to Adam,” “thus says the Lord,” “the Lord says,” “the oracle of the Lord,” and other similar statements? We are obviously dealing with speech that is different than human speech, a speech for the ears of the heart. God speaks the way he writes! Through the prophet Jeremiah he says, “I will put my law within them, and I will write it upon their hearts” (Jer 31:33). God does not have a human mouth and breath: his mouth is the prophet, and his breath is the Holy Spirit. “You will be my mouth,” he says to his prophets, or “I will put my words in your mouth.” It has the same meaning as the famous verse, “Men moved by the Holy Spirit spoke from God” (2 Pet 1:21). The term “inner locutions,” which indicates direct speech from God to certain mystic souls, can also be applied, in a qualitatively different and superior way, to how God speaks to the prophets in the Bible. We cannot exclude however that in certain cases, as in the baptism and in the transfiguration of Jesus, there was also an external voice resounding miraculously. In any case, we are dealing with speech in a real sense; the creature receives a message that can be translated into human words. God’s speaking is so vivid and real that a prophet can recall precisely the place and time in which a certain word “came upon” him: “in the year that King Uzziah died” (Is 6:1); “in the thirtieth year, in the fourth month, on the fifth day of the month, as I was among the exiles by the river Chebar” (Ez 1:1); “In the second year of Darius the king, in the sixth month, on the first day of the month” (Hag 1:1). God’s word is so concrete that it can be said to “fall” on Israel as if it were a stone: “The Lord has sent a word against Jacob, and it will [fall] upon Israel” (Is. 9:8). At other times the same concreteness and physicality is expressed not by the symbol of a stone that strikes but by bread that is eaten with delight: “Your words were found, and I ate them, and your words became to me a joy and the delight of my heart” (Jer 15:16; see also Ez 3:1-3). No human voice can reach human beings to the depth that the word of God reaches them. It “pierce[s] to the division of soul and spirit, of joints and marrow, and discern[s] the thoughts and intentions of the heart” (Heb 4:12). At times God’s speech is like a powerful “thunder” that “breaks the cedars of Lebanon” (Ps 29:5). At other times it seems like “the sound of a gentle whisper” (see 1 Kgs 19:12). It knows all the tonalities of human speech. The discourse on the nature of God’s speech changes radically at the moment in which we read in Scripture, “The Word became flesh” (Jn 1:14). With the coming of Christ, God now speaks with a human voice that is audible to the ears of the body. “That which was from the beginning, which we have heard, which we have seen with our eyes, which we have looked upon and touched with our hands, concerning the word of life . . . we proclaim also to you” (1 Jn 1:1, 3). The sacramentality of the Word of God is revealed in the fact that at times it works beyond the comprehension of the person who can be limited and imperfect; it works almost by itself—ex opere operato, just as we say about the sacraments. In the Church there have been and will be books that are more edifying than some books in the Bible (we only need to think of The Imitation of Christ), and yet none of them operates like the most humble of the inspired books. A similar thing happened to St. Augustine as well. At the height of his battle for chastity, he heard a voice say, “Tolle, lege!” (“Take and read!). Having the letters of St. Paul nearby, he opened the book with the intention of taking the first text he came across as God’s will. It was Romans 13:13ff: “Let us conduct ourselves becomingly as in the day, not in reveling and drunkenness, not in debauchery and licentiousness, not in quarreling and jealousy.” He writes in his Confessions, “No further wished I to read, nor was there need to do so. Instantly, in truth, at the end of this sentence, as if before a peaceful light streaming into my heart, all the dark shadows of doubt fled away. Starting with Guigo II the Carthusian, different methods and approaches have been proposed for lectio divina. They have the disadvantage, however, of having been devised almost always in relation to monastic and contemplative life and are therefore not well suited to our time in which the personal reading of the word of God is recommended to all believers, religious and lay. Fortunately for us, Scripture itself proposes a method of reading the Bible that is accessible to everyone. In the Letter of James (Jas 1:18-25) we read a famous text on the word of God. We can extract from it a plan for lectio divina in three successive steps or stages: receive the word, meditate on the word, and put the word into practice. Let us reflect on each of these steps. The sacred synod also earnestly and especially urges all the Christian faithful, especially Religious, to learn by frequent reading of the divine Scriptures the “excellent knowledge of Jesus Christ” (Phil. 3:8). . . . They should gladly put themselves in touch with the sacred text itself, whether it be through the liturgy, rich in the divine word, or through devotional reading, or through instructions suitable for the purpose and other aids. Saint James compares reading the word of God to looking at oneself in a mirror. The one who limits himself to studying the sources, the variants, and the literary genres of the Bible and does nothing more is like a person who spends time looking at the mirror—examining its shape, its material, its style, its age—without ever looking at himself in the mirror. The mirror is not fulfilling its proper function for him. Scholarly criticism of the word of God is indispensable and we can never be grateful enough to those who spend their lives smoothing out the path for an ever-increasing understanding of the sacred texts, but scholarship does not by itself exhaust the meaning of Scripture; it is necessary, but it is not sufficient. The other danger is fundamentalism, taking everything in the Bible literally without any hermeneutical mediation. These two excesses, hypercriticism and fundamentalism, are only seemingly opposite since both share in common the defect of stopping at the letter and ignoring the Spirit. With the parable of the sower and the seed (see Lk 8:5-15), Jesus offers assistance for each of us to discover our condition regarding receiving the word of God. He distinguishes four kinds of soil: the path’s soil, the rocky soil, the soil with thorns, and good soil. He then explains what the different types of soil symbolize: the path represents those in whom the words of God are not even implanted; the rocky soil represents those who are superficial and inconstant, who hear the word with joy but do not give the word a chance to take root; the soil with thorns represents those who let themselves be overwhelmed by the preoccupations and pleasures of life; the good soil represents those who hear the word and bear fruit through perseverance. In reading this, we could be tempted to skip hurriedly over the first three categories, expecting to end up in the fourth category, which, despite all our limitations, we think depicts us. In reality—and here is the surprise—the good soil represents those who easily recognize themselves in each of the first three categories! They are the people who humbly recognize how many times they have listened in a distracted way, how many times they have been inconsistent about intentions they formed in hearing a word from the gospel, how many times they have let themselves be overwhelmed by activism and worldly preoccupations. These are the ones who, without knowing it, are becoming the truly good soil. May the Lord grant that we too be counted in that number! You who are accustomed to take part in divine mysteries know, when you receive the body of the Lord, how to protect it with all caution and veneration lest any small part fall from it, lest anything of the consecrated gift be lost. For you believe, and correctly, that you are answerable if anything falls from there by neglect. But if you are so careful to preserve his body, and rightly so, how do you think that there is less guilt to have neglected God’s word than to have neglected his body? For the word of God is living and active, sharper than any two-edged sword, piercing to the division of soul and spirit, of joints and marrow, and discerning the thoughts and intentions of the heart. And before him no creature is hidden, but all are open and laid bare to the eyes of him with whom we have to do. (Heb 4:12-13). In the mirror of the word, fortunately, we do not see only ourselves and our shortcomings; first of all we see God’s face, or better, we see God’s heart. St. Gregory the Great says, “What is sacred Scripture but a kind of epistle of almighty God to his creature? . . . Learn the heart of God in the word of God.” Jesus’ saying, “Out of the abundance of the heart the mouth speaks” (Matt 12:34), is also true of God. God has spoken to us in Scripture of what fills his heart, namely, love. All the Scriptures were written with the goal that human beings would understand how much God loves them and in learning this might become enkindled with love for him. The Jubilee Year of Mercy is a magnificent occasion to reread all of Scripture from this perspective as the history of God’s mercy. Now we come to the third phase of the path proposed by the apostle James: “Be doers of the word . . . for a doer that acts, he shall be blessed in his doing” (Jas 1:22, 25). On the other hand, “If any one is a hearer of the word and not a doer, he is like a man who observes his natural face in a mirror; for he observes himself and goes away and at once forgets what he was like” (Jas 1:23). Being a “doer of the word” is also what is most on Jesus’ heart: “My mother and my brethren are those who hear the word of God and do it” (Lk 8:21). Without “doing the word” everything is illusion and building on sand (see Matt 7:26). People cannot even say that they have understood the word because, as St. Gregory the Great says, the word of God is truly understood only when people begin to practice it. St. Augustine, Tractates on the Gospel of John 55-111, 80, 3, vol. 90, trans. John W. Rettig, The Fathers of the Church (Washington, DC: Catholic University of America Press, 2014), p. 117. Jacques-Bénigne Bossuet, “Sur la parole de Dieu,” in Oeuvres oratoires de Bossuet, vol. 3 (Paris: Desclée de Brouwer, 1927), p. 627. S. Augustine, Confessions, VIII, 29, trans. John K. Ryan (Garden City, NY: Doubleday, 1960), p. 202. Dei verbum, n. 21. Quotes from papal documents are taken from the Vatican website. See Guigo II, The Ladder of Monks: A Letter on the Contemplative Life, trans. Edmund Colledge and James Walsh (Kalamazoo, MI: Cistercian Publications, 1981). Søren Kierkegaard, Self-Examination / Judge Yourself, ed. and trans. Howard V. Hong and Edna H. Hong (Princeton, NJ: Princeton University Press, 1990), p. 29. Origen, “Homily 13 on Exodus,” 3, in Homilies on Genesis and Exodus, trans. Ronald E. Heine (Washington, DC: Catholic University of America Press, 2010), pp. 380-381. Guigo II, The Ladder of Monks, 3, p. 68. Augustine, Expositions on the Psalms, 46, 1, The Works of Saint Augustine, Part 3, vol. 16, trans. Maria Boulding, ed. John E. Rotelle (Hyde Park, NY: New City Press, 2000), p. 325. See Gregory the Great, “Letter 31, to Theodorus,” in Epistles of Gregory the Great, vol. 12, Nicene and Post-Nicene Fathers, trans. James Barmby, eds. Philip Schaff and Henry Wace (Grand Rapids: Eerdmans, 1997), p. 156. See Augustine, First Catechetical Instruction, 1, 8, vol. 2, Ancient Christian Writers (Mahwah, NJ: Paulist Press, 1978), p. 23. Gregory the Great, Homilies on the Book of the Prophet Ezekiel, 1, 10, 31, trans. Theodosia Tomkinson, 2nd ed. (Etna, CA: Center for Traditionalist Orthodox Studies, 2008), pp. 200-201; see also CCL 142, p. 159. Ignatius of Antioch, “Letter to Polycarp,” 4, 1, in The Apostolic Fathers: Greek Texts and English Translations, 3rd ed., ed. and rev. trans. Michael W. Holmes (Grand Rapids: Baker Academic, 2007), p. 265. Augustine, “Sermon 88,” 13, The Works of Saint Augustine, Part 3, vol. 3, trans. Edmund Hill, ed. John E. Rotelle (Brooklyn, NY: New City Press, 1991), p. 341. See Abbot Moses in John Cassian, Conferences, “Conference One,” 18, trans. Colm Luibhéid (Mahwah NJ: Paulist Press, 1985), p. 52.